My patch neighbour (and rival) found two sedge warbler yesterday evening; I must confess, it made me a little envious as it's on my wanted list and I've spent many hours already this year scouring likely locations to see one myself. The last time I saw sedge warbler locally was a few years ago when a pair bred in a dyke near the equestrian centre. So this morning, fuelled with optimism that his sighting was a sign that more were passing through, I got up early and headed for the oxbow lake. I walked around the water to the reed-beds but none were seen or heard. Not having long before work, I didn't hang around and headed despondently back to the car. 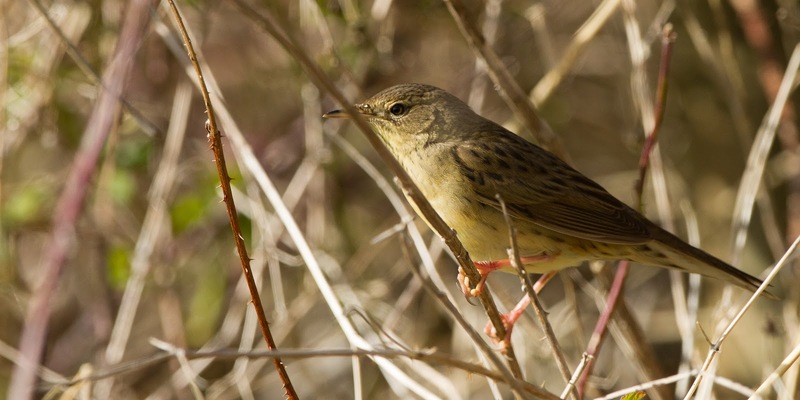 Then in the scrub I'd just passed, I heard it, the characteristic reeling of a grasshopper warbler! Not a common bird locally by any means (in fact I think the only 3 modern records have all been found by me) and this is the first on my patch. I had a hide in the car so rushed to fetch it and set it up in the hope the bird would break cover. Thirty minutes passed and all I could see was a little brown shape skulking out of view. Then just as I was about to give up, it jumped onto an exposed branch; bird 98 on my patch list and one I could only hope for (and worth being late for work to photograph). Fantastic shot, well worth your early start and it makes up for the lack of Sedge Warblers i'd say! Thank you, Pam... I still want those tricky sedge warblers too! Thank you, David... I think it's pot luck whether they turn up or not and you're there when they do! Re. getting photos: I carry a portable hide with me for these very situations. <£75 to cover up gets you as close as spending £000's on a big lens!